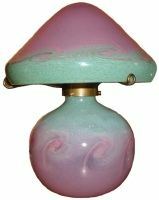 At the time that the first Vasart catalogue was produced in 1993, only two Vasart mushroom lamps were known of. The gourd shaped L002 and Lynn Letham’s mushroom L005. The latter was sold after Ms Letham’s death at a Christies auction in June 2001 described as Monart. It reappeared at a Scottish auction in 2002 also described as Monart. 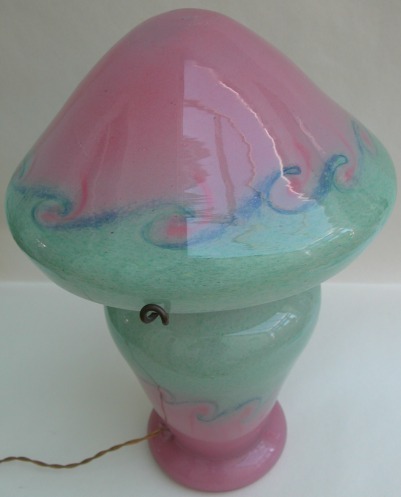 It is now in a Scottish collection as Vasart and I was able to obtain good images of the lamp. Since then a few more have shown up and I am confident that more will appear over the next few years. But, they are likely to remain one of the scarcest types of Ysart Glass. The Vasart fittings are very distinctive from the Monart ones and the same design is found in all examples seen so far. 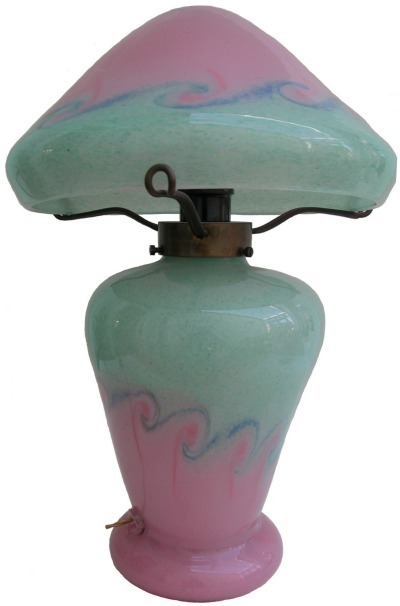 Lamps have been found with the early black and white label, signed and unsigned - so were probably produced throughout the Vasart period.